Sit down to a real Fijian Kava Ceremony. This Deluxe kit has it all! 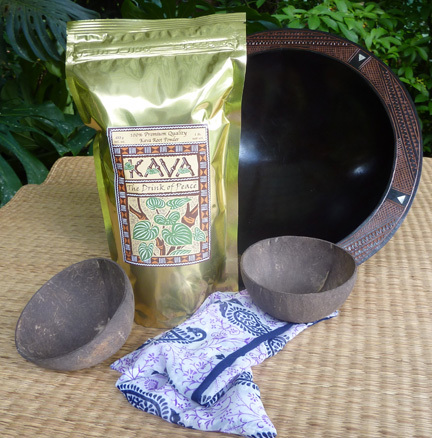 15 inch kava bowl includes one pound of our Premium Quality Vanuatu Kava, one strainer bag, and two coconut cups. Bought separately the cost of these products would be $230.95. Priced at $199.95 you save $30.00! Currently we carry both black and brown wooden bowls with one of a kind detail carved around the rim. Styles may have mother of pearl insets as well. Unless specified (in the comment section at checkout) you will receive whatever style/color bowl is currently available in the size you select. Please note that because these bowls are hand carved in Fiji, variations and small imperfections may be present.